The Argentine Republic is located in the South and West Hemisphere. Its relative position in South America gives the country a diversity of land and culture. From the artic regions in the south, to the forested jungle regions in the north, from the ocean coastline on the Atlantic, to the rugged mountain regions in the west, and bordering five other countries, Argentina provides an important cultural and economic connection for all of South America. Limits and Extreme Points. American Portion. To the North it is bounded by the Republics of Bolivia and Paraguay, which extreme point is in the confluence of the rivers Grande in the Province of San Juan and Mojinete in the Province of Jujuy (Lat. 21°46’ S; Long. 66°13’ W). To the south it is bounded by the Republic of Chile and the Atlantic Ocean being the most austral point the Cabo San Pío, located in Isla Grande of Tierra del Fuego (Lat. 55°03’ S; Long. 66°31’ W). To the east it is bounded by the Federative Republic of Brazil, the Oriental Republic of Uruguay and the Atlantic Ocean. 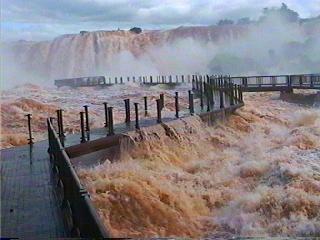 The extreme eastern point is located in the city of Bernardo de Irigoyen, in the Province of Misiones (Lat. 26°15’ S; Long. 53°38’ W). To the West it is bounded by the Republic of Chile. The extreme point is located between Cerro Agassis and Cerro Bolados (in the Mariano Moreno mountain chain) in the Glaciers National Park – Province of Santa Cruz (Lat. 49°33’ S; Long. 73°34’ W). Today, there have been 23 visitors (106 hits) on this page!